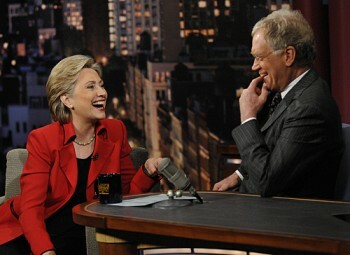 From the home office in Wahoo, Nebraska…it’s Hillary Clinton for David Letterman’s Top 10. As presented by Democratic Presidential Candidate Sen. Hillary Clinton on the Monday, May 5 broadcast of “The Last Show with David Letterman” on CBS television. 10. We have more Dakotas than every other country combined. 9. Canadian bacon: soggy and chewy; American bacon: crisp and delicious! 8. Thanks to the Internet, I can order new pantsuits 24/7 – there’s your pantsuit joke, Dave. Are you happy now? 7. 232 years and not one cookie shortage. 5. Did I mention the soup? Mmm, soup. 4. Did you know former President Teddy Roosevelt was an American? 3. Where else can you get a car painted for $29.95? 2. Is this the part where I say, “Live from New York, it’s Saturday Night!”? 1. Apparently anyone can get a talk show.